Are you building a new home? Remodeling an older home? Or just want to spruce things up a little? Have you thought about your light switches? They are a vital part of every room, every wall. Decora switches might be just what you’re looking for! They’re as easy to install as any other switch and much wider for easier use. 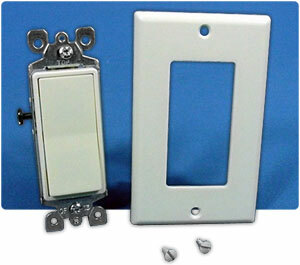 You can also pick out your own style of face plate with a Decora switch. www.TWAcomm.com is the place to go! Leviton Decora switches come in different types, including dual, three way, and programmable timer switches. The wide selection has whatever you need in the way of Decora switches at very low prices. They’re perfect for the do-it-yourself project or a professional contractor. When you’re working on a big project, such as home renovation, the last thing you want to do is drop everything and run to the store. Paying store prices and travel time can be a hassle for even a small job. Moreover, if you’re replacing all your switches, it could be a serious nuisance. Suppose the store you have to go to doesn’t have as many switches as you need? What if they don’t have enough to fill your needs? The solution is simple. As simple as using your computer and buying your Decora switches online at www.TWAcomm.com! You’ll get the right number of each type of switch, at a good price, all delivered to your door. What could be easier? Whether you’re doing a small job or renovating an entire apartment complex, the Decora switches you need are available online and ready for you to order. Their online catalog will show you all the possibilities with clear descriptions of each switch and its uses, including pictures so that you can view the product before you purchase it. You can see the prices beside the pictures so there’s no guesswork and you’ll know what every single item costs. Leviton Decora switches can make a big difference in your wiring projects. Not only will you have the best switch available but it’s easy to buy and the price is right. If you need to replace Decora switches or add a new one, it’s as easy as "point, click, buy". It doesn’t matter if you only need one switch for the new workshop or several for your garage, buying Decora switches online is the best way to shop for your lighting and electrical needs. Even your ceiling fan can use a Decora switch! No matter what your electrical needs may be, there’s probably the perfect answer to your problem at www.TWAcomm.com where you can find the exact Leviton Decora switches to solve it. The timer switches, for example, are perfect for turning on your house lights while you’re away. Imagine coming home at night and having the house lit up instead of dark! Decora switches can be a great safety feature for your home! Why not check it out today?